The immigrant experience is a favorite topic in film, particularly in the American cinema. It is no coincidence that Hollywood’s origins stem from a few ambitious immigrants who headed out west to get away from Thomas Edison’s patent enforcement, as well as for the sunshine, pleasant weather, and open landscapes. Those immigrants aside, America is a nation founded by immigrants that continues to grow and change with the addition of new ones. Immigration is the topic of the day for many political candidates, and it is a continuing fascination that is sometimes treated simplistically and other times with great complexity in the cinema. This week, a new film about immigration to America opens, but it is not a Hollywood production. 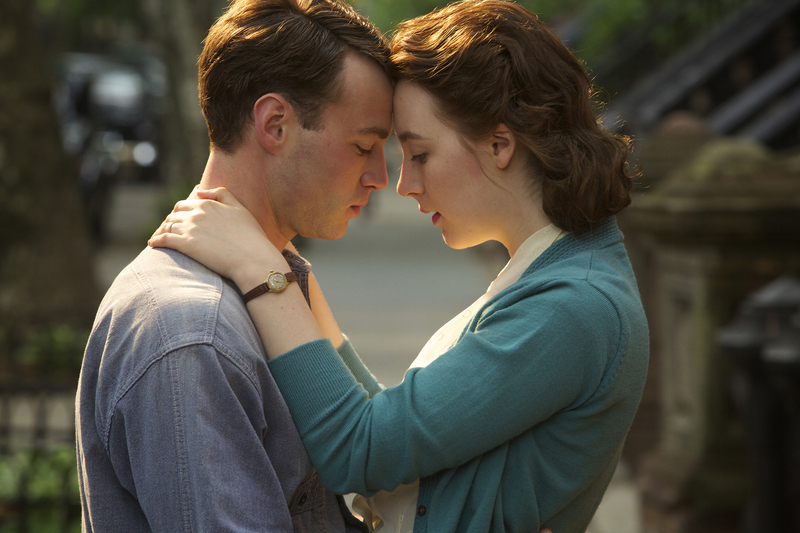 Brooklyn is an Irish film about an Irish girl who emigrates to the United States in the 1950s. As such, there are a number of differences in how the immigration experience is envisioned. The story focuses on Eilis Lacey (Saoirse Ronan), the youngest of two daughters to a widow in a small village in Ireland. Her older sister Rose (Fiona Glascott) arranges for Eilis to have a job and a place to stay in America. Seeing nothing but small-town doldrums, Eilis goes on the journey and establishes a new life in America. But when she is called back home for a family emergency, she begins to question which life is more authentic to her true self. The emigration of Irish people to the United States is so often framed around the early part of the 20th century, or even before, when immigration was at a peak for the Irish, Italians, and any number of other groups. It is surprising to see a tale of Irish immigration taking place in the 1950s. This choice of setting, (which comes from the Colm Tóibín book of the same name, upon which Brooklyn is based) reduces the usual dramatic tensions around ethnicity. And while Eilis does come to date an Italian-American boy, Tony (Emory Cohen) and the tensions between the Irish and Italians are referenced lightly, the prejudice the Irish once fell victim to has mellowed by the 1950s and is therefore not a major concern of the film. Eilis’s world of 1950s Brooklyn is peppered with a colorful group of her countrymen and women. The Irish enclave resembles life back in Ireland, but only to a point; in America, people don’t care as much about your personal business, or at least in the urban neighborhoods they don’t. So when Eilis goes back to Ireland, the differences between small-town life, complete with modest expectations, irritating busy-bodies, and traditions that you’re expected to uphold, and the freedom to reinvent yourself and follow any dream you desire in New York City are accentuated. Brooklyn is well-acted and absorbing, but the relationship between Eilis and Tony, upon which much of the dramatic tension rests, is lukewarm. Both actors are charming and in fact, adorable throughout, but the passion between them is awkward, leaving room for a lot of doubts that distract from the tension we’re supposed to be focused on. It’s a lovely film with a few wonderful moments, but more than anything, it makes me want to read the book and see all the color that is likely left out of the film. It also had me thinking about my own Irish roots and the nature of being Irish. For that, I was glad to see this film, which shows at Cape Cinema November 25 – December 10.